Carmarthenshire: Brechfa, Llandifeisant, Llandilo Fawr (4), Llandybie (2), Llaneggwad (2), Llanfynydd (2), Llangathen (2), Llansawl (2), Llanvihangel Aberbythyrch, Llanvihangel Kilfargen, Talley (2). The population falling within the Union at the 1831 census had been 15,614 with parishes ranging in size from Llanvihangel Kilfargen (population 69) to Llandilo Fawr itself (5,149). The average annual poor-rate expenditure for the period 1834-36 had been £5,653 or 7s.3d. per head of the population. The Llandilo Fawr Union workhouse was erected in 1837-38 at Ffairfach, about half a mile to the south of Llandilo. Intended to accommodate 120 inmates, its construction cost was £2,243. The building was designed by George Wilkinson who was responsible for at least eight other workhouses in Wales. Its location and layout are shown on the 1907 map below. The workhouse design was based on the popular square plan where accommodation wings for the different classes of inmate (male/female, infirm/able-bodied) radiated from a central supervisory hub. The area in between the wings formed segregated yards where the inmates could take exercise. An entrance block at one end contained a porter's lodge, board room and offices. 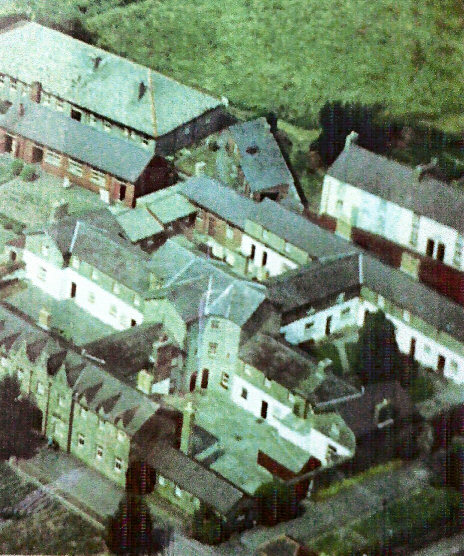 Aerial view of Llandilo Fawr workhouse site, 1960s. From 1930 to around 1948, the former workhouse operated as the Abercennon Public Assistance Institution. The buildings survived until the mid-1960s but were then demolished and residential accommodation now occupies the site. Llandilo Fawr workhouse site, 2000. Carmarthenshire Archives Service, Parc Myrddin, Richmond Terrace, Carmarthen, SA31 1HQ. Few records survive — main holdings are Guardians' minute books (1836-1930).